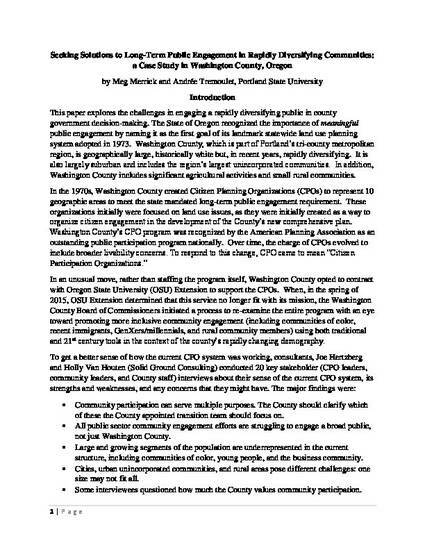 This paper explores the challenges in engaging a rapidly diversifying public in county government decision-making. The State of Oregon recognized the importance of meaningful public engagement by naming it as the first goal of its landmark statewide land use planning system adopted in 1973. Washington County, which is part of Portland’s tri-county metropolitan region, is geographically large, historically white but, in recent years, rapidly diversifying. It is also largely suburban and includes the region’s largest unincorporated communities. In addition, Washington County includes significant agricultural activities and small rural communities. Presented at the Urban Affairs Association Conference in San Diego, March 17, 2016.